Includes long sleeve event t-shirt and on-line scoring provided by WOD Rocket. Just a reminder that we will only be holding two classes tomorrow at 8 am and 9 am. U.S. FBI Supervisory Special Agent Gregory J. Rahoi, 38, of Brookfield, Wisconsin, assigned to the Hostage Rescue Team, based in Quantico, Virginia, was killed on December 6, 2006, during a live-fire tactical training exercise at Fort A.P. Hill, near Bowling Green, Virginia. He is survived by his parents, Natalie and Richard, sister Teri, and fiance Paula Paulk. 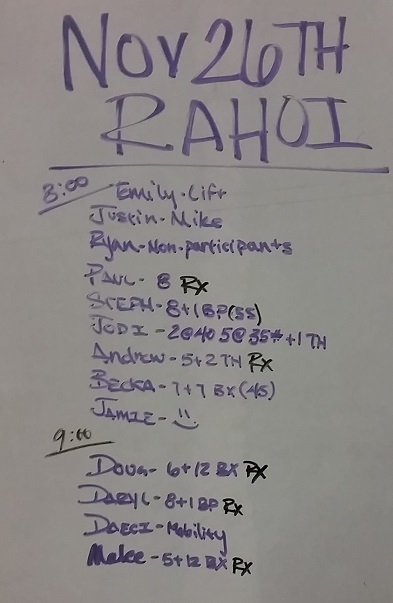 We will be holing one class on Thanksgiving day at 8 am if you need to get your workout in prior to some fantastic foid. Hope everyone enjoys a great Thanksgiving.